Yesterday, January 15th is known as the day by which people have given up on their New Year’s Resolutions or intentions for the year ahead. We at CarePlus do not want this figure to include you, as we know many of you have “quit smoking” at the top of your health agenda for 2019. 1 in 2 smokers will die from a tobacco-related disease – an alarming figure. Information adapted from the official HSE website. You will have fresher breath, hair and clothes. You will have more money in your pocket. Your blood pressure and pulse rates begin to return to normal. Your risk of heart attack begins to fall. You will have a better sense of taste and smell. You will feel fitter as you will be less breathless. Your risk of sudden death from a heart attack is almost cut in half. Your risk from cancer is also reduced. Prepare – Weigh up the pros (why I want to quit smoking) and cons (what I enjoy about smoking) of quitting. Write down your reasons and keep them close by. Save the date - Make a date to quit and stick to it. Get support – Ask your family and friends for support. Telling people your plan to quit and the steps you intend to take to get there makes it less likely that you will give up. Talk to your friendly CarePlus Pharmacist for any support and guidance you may need. Change the routine – Replace or change activities in your daily or weekly routine that you would usually associate with smoking. This way you won’t be so tempted. Get active – Regular activity is good for your health and helps you to manage stress in the way that smoking might have done before. Think positive – You may have withdrawal symptoms once you quit smoking – look at these as positive signs that your body is recovering from the harmful effects smoking has had on you. These will fade as you get used to not smoking. Learn to deal with cravings – Try drinking juice or water or eating fruit when you feel like having a cigarette. This will freshen your mouth and help lower your craving. Each craving only lasts 3-5 minutes and they will pass. Save – Put away the money that you would otherwise spend on tobacco or cigarettes. You will be amazed at how much money will build up in a short space of time. Watch what you eat – If you are worried about putting on weight after quitting, just be careful about what you eat. Take it one day at a time – Remember, every day without smoking is a positive step for your health, your family and your wallet. However, if you slip-up, don’t beat yourself up about it - set a new date and start again. Stay positive. When you feel tired and tempted to give in, remember why you started. Don’t think ‘one cigarette won’t hurt.’ This is an excuse and will send you spiralling backwards. Stay determined. The craving will pass. Keep busy. Distract your mind. Don’t allow yourself to be tempted to smoke – don’t accept a cigarette from a friend who offers you one. Get active. Going for a walk will boost your energy levels and help take your mind off needing a cigarette. Don’t throw in the towel after one slip up. Save your money & reward yourself. Don’t forget why you decided to quit in the first place. Be mindful when drinking alcohol, it can affect your willpower and increase temptation. Don’t feel alone – you have support and you can do it. 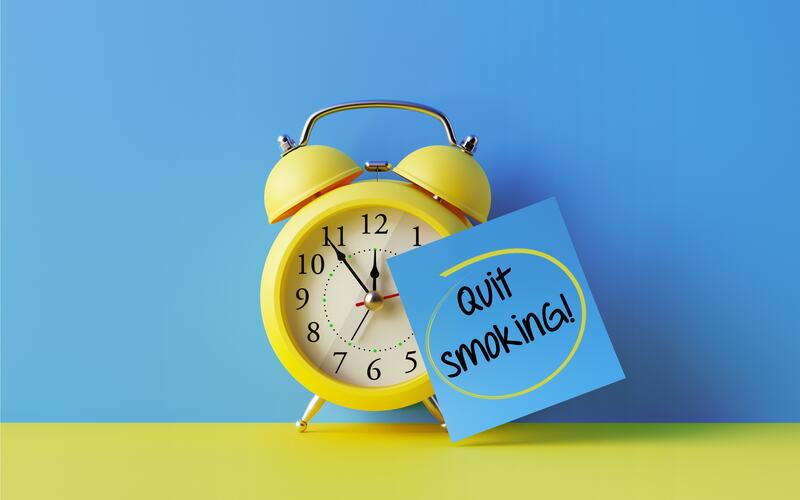 If you are finding it hard to quit, you can get help by calling the National Smokers’ Quitline on 1850 201 203 or visiting www.quit.ie, or you can speak to your GP or CarePlus Pharmacist about nicotine replacement therapies and medications.